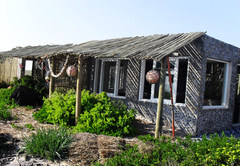 Grootvlei on the Dunes is a Lamberts Bay Bed & Breakfast providing accommodation in 4 guest rooms for tourists visiting the Cape West Coast region. 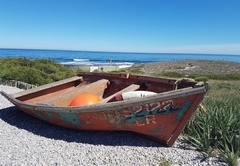 Grootvlei Guest Farm is situated 6km from the charming fishing village of Lambert’s Bay with its moderate climate all year round. 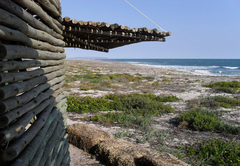 It is within walking distance of the Atlantic Ocean with its long, uninterrupted white beaches. 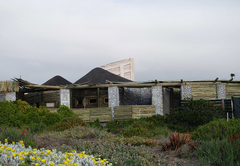 The Grootvlei on the Dunes is a cluster of sea shell-encrusted rooms, also referred to as “skulphuisies” (shell houses), and consists of one grand / honeymoon suite and three double rooms. 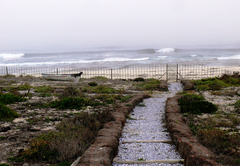 It is situated right on the dunes overlooking the ocean. 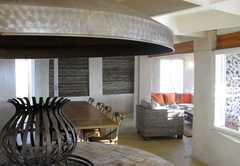 All the shell-shaped rooms are beautifully decorated and have an elegant, yet rustic feel. 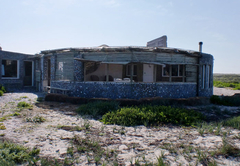 The charming honeymoon suite comes with an open-roofed, oyster-shaped bath where you can relax while watching the stars and listening to the ocean. 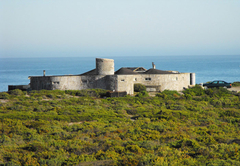 The rooms have traditional West Coast “latjieshuis” (reed house), finishes throughout. 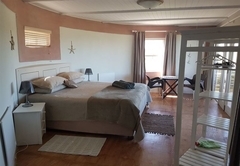 All rooms have an en-suite bathroom and there is a communal, fully equipped kitchen and a comfortable lounge / dining area with an undercover veranda, offering exquisite and uninterrupted vistas of the ocean. 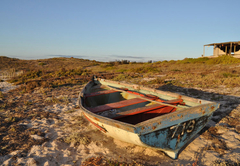 With fishing, hiking, bird watching and swimming on the property and 4x4 routes, plus boat trips and game drives in the near vicinity, there is ample opportunity for relaxing or winding down after a long conference. During the flower season from July to early October each year, the area is covered with a tapestry of wild flowers. 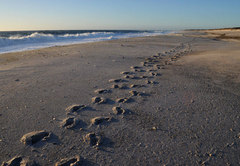 Conservation of the dune vegetation has seen the return of small game and you will notice their footprints around the buildings. You may even spot a duikertjie or other buck on an early morning walk. 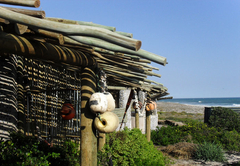 Birdwatchers will have a field day spotting a large variety of birds, and if you are lucky, you may see Heaviside’s dolphins, whales and seals frolicking in the blue waters a short distance from the beach. Kingsize luxury bed. 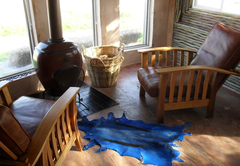 All rooms have an en-suite bathroom and there is a communal, fully equipped kitchen and a comfortable lounge / dining area with an undercover veranda, offering exquisite and uninterrupted vistas of the ocean. Standard Double bed. 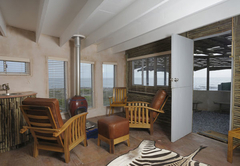 All rooms have an en-suite bathroom and there is a communal, fully equipped kitchen and a comfortable lounge / dining area with an undercover veranda, offering exquisite and uninterrupted vistas of the ocean. luxury kingsize bed. 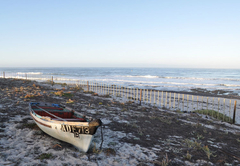 All rooms have an en-suite bathroom and there is a communal, fully equipped kitchen and a comfortable lounge / dining area with an undercover veranda, offering exquisite and uninterrupted vistas of the ocean. 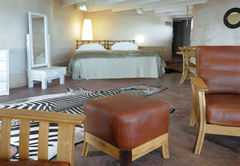 Grand Suite - Honeymoon. 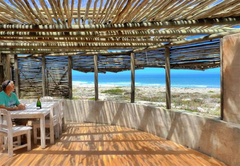 All rooms have an en-suite bathroom and there is a communal, fully equipped kitchen and a comfortable lounge / dining area with an undercover veranda, offering exquisite and uninterrupted vistas of the ocean. 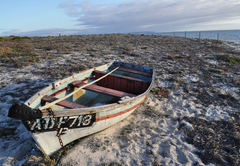 Response timeGrootvlei on the Dunes typically responds to requests in 5-10 minutes.